UPDATE: 'buy now' buttons are now working! Apologies for the inconvenience early! GOOD CHEER PRICE: $10 with free shipping & handling! 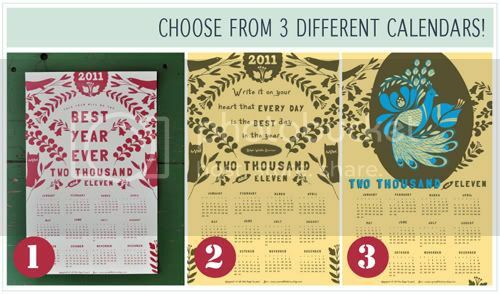 I love these calendars from Spread the Love. and I predict 2011 will be the best year ever, or at least a great year! 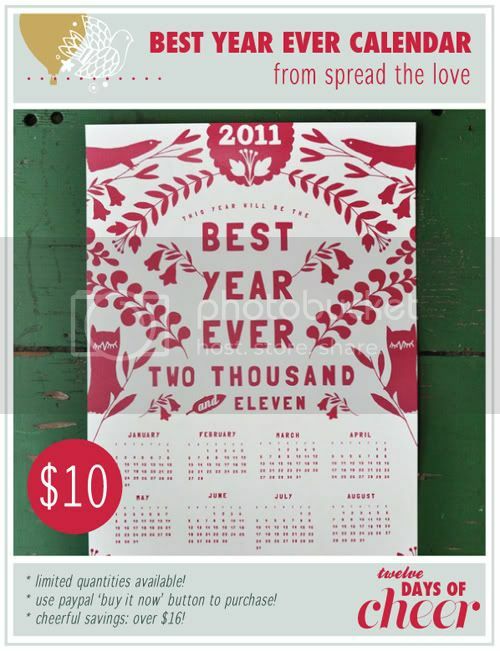 Spread the Love is offering 3 different calendars! So choose from 3 designs and buy yours below! - Please be sure to visit Spread the Love and support! I am deeply in love with that calendar! I was going to press Buy Now when I realized this was only for US peeps... darn. Those are so pretty!! These calendars are beautiful! Since no one has posted a comment saying they've bought one yet, I highly doubt all three are sold out . . . but when I click on any of the 'buy now' links it takes me to paypal but has nothing about the print I want to buy! The same thing happens to me, Sarah. I love the first one! i'd like to buy the second one but it seems i'm having the same problem as some other people...paypal isn't connecting to a purchase, it's simply connecting to the main site. if that makes sense. Hi Ladies! SO sorry about the 'buy now' paypal buttons not working -- but they work now so you can purchase a calendar if you wanted one :) Thanks for your support! Just purchased one - everything worked just fine! THANK you so much for the cheer and thank you to Spread the Love for sharing! These are beautiful. I'm pleased to say I was able to buy a calendar (#1)! done! i bought #1. thank you!!! so so amazing. I bought number 2! Thank you for the wonderful deal! I bought #1- can't wait for it to get here! JUST PURCHASED THE FIRST ONE! I'm in love. I love these. very optimistic. great deal! i bought #1. Just purchased #3 - so beautiful! just purchased #2 emerson quote calendar.